This Gigaku theatre mask represents Karura, a divine bird in Indian mythology that was introduced into the Japanese Buddhist pantheon as one of the eight guardian divinities. The bird’s ferocious appearance is heightened by its long hooked beak, framed by red feathers, in which it holds a pearl. Originally the bird boasted a crest, which has since disappeared. The stylistic and iconographic features of these masks reveal not only Chinese, but also Central Asian, and perhaps Greek influences. The sculpted paulownia wood mask concealed the actor’s face, and traces of red and green pigmentation show that this specimen was originally painted in bright colors to emphasize its fantastic aspect. The outer surface was first given a fine coating of gesso, then a coating of lacquer, and finally colored paints were applied. 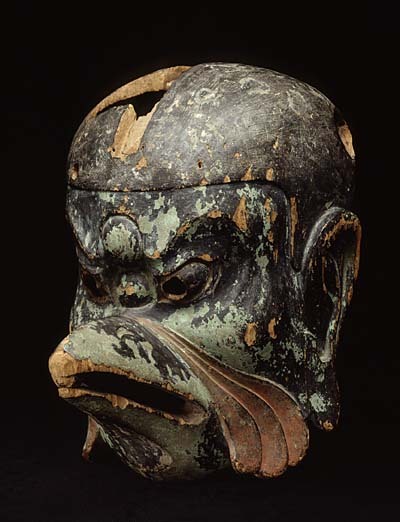 Today, Gigaku masks are the sole vestiges of a dramatic art that reached its pinnacle in 8th century Japan. Gigaku theatre performances combined mime, masked dances and music. Despite their secular character they were closely associated with the rituals of great Buddhist temples. This mask, for instance, was worn during the consecration ceremonies for the great Buddha of Todaiji in 752 (see the internal inscription). It attests to the potent influence of foreign Buddhism at this period, transmitted by Chinese, Indian and South Asian monks. These monks came to Japan accompanied by artists who were to bring with them an artistic repertoire composed of borrowings from the various cultures found along the Silk Road. Throughout this period, Japan devoted its intellectual and political efforts to assimilating a continental culture of which Buddhism was the most representative institution and the most dynamic school of thought.